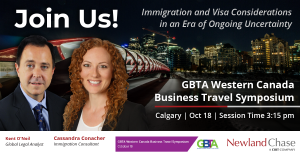 The GBTA Western Canada Business Travel Symposium 2018 is an evolution of the successful GBTA Canada Energy, Resources & Marine Symposium that has taken place in Calgary from 2014-2017. This year’s event will expand the event platform to incorporate the key industry economic drivers for western Canada impacting business travel. This symposium will focus primarily on business travel, logistics and crew/camp movement, and accommodations within the industry sectors of Oil, Gas, Energy, Resources, Mining, Forestry & Agriculture, all specific to the western Canadian provinces of Saskatchewan to British Columbia. The event kicks off with subject matter experts speaking about the provincial economic outlook for Western Canada, and takes in a keynote speech from Global Calgary’s TV News Anchor, Linda Olsen, who shares her journey in the world of broadcast journalism. Join Newland Chase’s Global Legal Analyst, Kent O’Neil, and Immigration Consultant, Cassandra Conacher, as they present their session, ‘Immigration and Visa Considerations in an Era of Ongoing Uncertainty’ at 3:15pm.